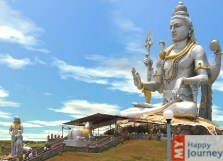 Sited in Bhatkal Taluk, Murudeshwar is a small town of Karnataka. Despite of its small size, the town managed to make its mark on the travel map of India mainly because of the tallest statue of Lord Shiva and the renowned Murudeshwar temple. The Murudeshwar temple is positioned on a peninsula and has Arabian Sea on its three sides. This is the reason the statue of Lord Shiva here is exposed to all types of weather conditions and this is affecting the statue severely. This temple has a lot of religious significance for Hindus, as it has one of the pieces of the Atma Linga, considered to be tattered apart by Ravana in a fit of wrath. Moreover, the tallest entrance in the world also makes this temple a must visit place. Besides the temple, other main attractions include a number of exhilarating sea activities. One can indulge in swimming, snorkeling etc. in this serene place. The area around the temple is an ideal walkway. With close proximity to the beach, it offers a relaxing ambiance. Apart from this, from the hillock of the temple, one can have a mesmerizing view of the setting sun to end the day. For families the most ideal and popular attraction is the wave pool. It has so much to offer that you can easily spend hours enjoying here with your loved ones. The multi storey restaurant on water surely makes the whole experience an unforgettable one. Positioned between the beautiful and verdant green hillocks, along with temples and the statue of Lord Shiva, this small town is undoubtedly the perfect location to make your holiday a memorable experience.